BIBLE: Basic Instruction Before Leaving Earth. The Bible lies at the heart of Christian belief and practice. The word itself comes from the Greek biblos ('Books'), and indeed the Bible is a collection of books, written by several authors over a time period roughly from 1500 B.C. to 100 A.D. Structurally, the Bible is divided into an Old and a New Testament. The word testament means 'covenant' and reminds us of God's covenant, first with Israel and then with mankind through Jesus Christ. The answers to some common questions about the Bible are found on the Christianity Q and A page. There is also a page devoted to Bible References for topics such as Death, Faith and Living the Christian life. The Torah or 'law' - this consists of the five books of Moses (Genesis, Exodus, Leviticus, Numbers and Deuteronomy). The Nevi'im or 'prophets' - for example Isaiah, Jeremiah and Joel. The Ketuvim or 'writings' = this includes books of wisdom such as the Psalms and also historical books such as Chronicles. These books form the basis of the Christian Old Testament. The original text of the Old Testament was written in Hebrew, with some portions in Aramaic (a language spoken by Jesus). Around the third century B.C. it was decided to begin a translation into Greek, as that language was known to many Jews. This translation was known as the Septuagint or LXX, from the legend that 72 Jewish scholars worked on it. The Septuagint included a number of books not present in the Hebrew text, but considered by some as being divinely inspired and therefore worthy of inclusion. In the Protestant tradition, these books were rejected and termed apocrypha (Greek: 'Hidden things'). However, both Orthodox and Roman Catholic Christians accept some or all of them, and term them deuterocanonical i.e. a second canon or 'rule' of scripture. 1. The four gospels of Matthew, Mark, Luke and John, written approximately between 60-90 A.D.
2. The Acts of the Apostles - A book focusing mainly on the apostles Peter and Paul, and detailing the spread of Christianity in the first 30 or so years after the death of Christ. 3. The Epistles of St. Paul. 4. The General Epistles, including those of Sts. Peter and John. 5. The Book of Revelation - a book dealing with the apocalypse (Greek: 'unveiling'). That is, a series of visions received by St. John on the Greek island of Patmos. These statistics relate to the King James version. The Bible has 66 books (39 in the Old Testament and 27 in the new). These books in turn contain 1,189 chapters, 31,101 verses and 783,137 words. The longest verse is Esther 8:9 (78 words) and the shortest is John 11:35: "Jesus wept." The number of different authors is over 40. 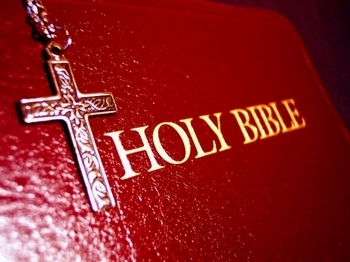 The word 'God' appears over 3,000 times in the Bible. Each book has an associated article linked to it. Click each book for more information. * In St. Jerome's translation of the bible (The Vulgate), Ezra and Nehemiah were called 1 and 2 Esdras respectively. ** Full title: the Lamentations of Jeremiah. *** These books are often grouped together and called: Additions to the Book of Daniel. The full title of the Prayer of Azariah is: The Prayer of Azariah and Song of the Three Holy Children. The King James Version is available for download, together with a KJV dictionary and the Apocrypha or Deuterocanonicals. Also available is the World English Bible, a version based on the American Standard Version which was first published in 1901.